We are heading off tomorrow morning for The Whitechapel Gallery in London to look after our stall at The London Art Book Fair. Lots to pack up and last minute things to remember to do. 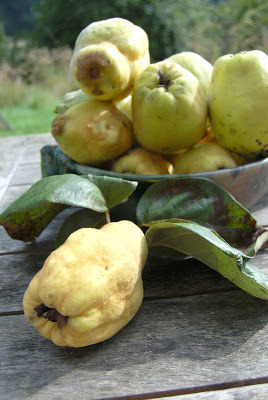 I just want, however, to make a little post in honour of our Quince tree which has made a jolly good effort this year and has provided us baskets of these strange fruits from which Frances will make delicious jelly. Inevitable, too, that we should be reminded that Robin and Heather Tanner chose this word (obvious, really!) to show off what a delicious capital Q can do! 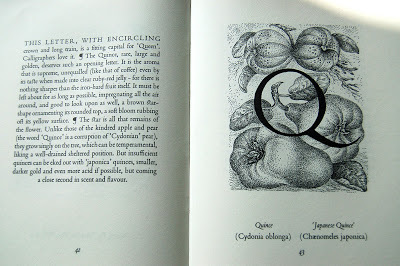 Here is the the spread from A Country Alphabet so that you can see the pen and ink drawing and an example of Heather’s gentle but precise commentary. Amazing to realize that this book was published 26 years ago. But . . . I must apologise for going on and on about the passage of time. This is what comes from being stuck to the production of a Bibliography for such a long time!